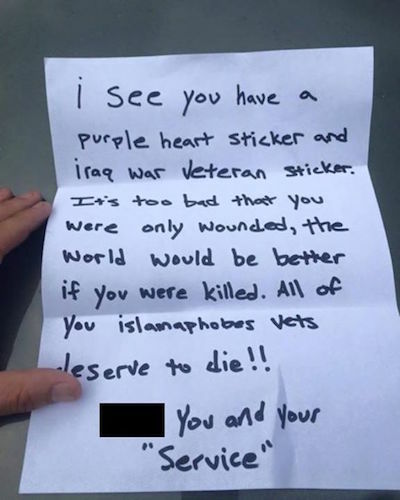 Military Vet Finds This Hateful Note On Car And You Won't Believe What It Says! 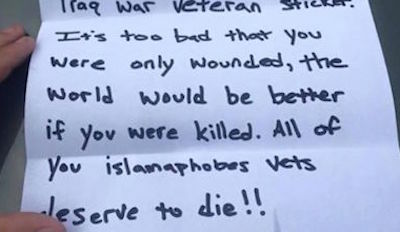 A simple trip to the store ended with a veteran getting a hateful letters left on his car. When a local Iraq war veteran was shopping Thursday morning, he did not expect to find an anonymous note with ugly language left on his car. The note has people shaking their heads. Some called the author pathetic. News 10 ABC showed the note to Lieut. Steven Stockdale from the Warren County Sheriff’s office to determine if the person who wrote it could face charges. Stockdale said it is illegal to leave a note on a windshield, but he said the biggest disappointment is that the author thought writing a letter was okay. She Put This Baby In A Green Bag, Then Watch What Happens Next!